Looking for a quick and comforting dessert? 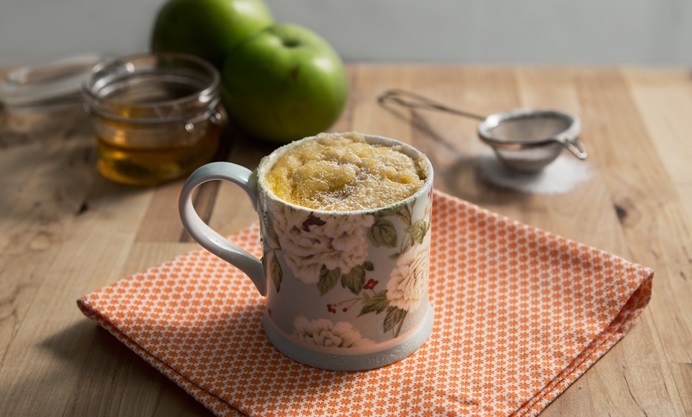 Try these "magic" microwave mug cakes. You can adapt the batter and add your favourite flavourings. They're fun to make with kids at weekends and during school holidays too. I love apples, and I’m lucky enough to have three apple trees in my garden – one Bramley apple tree and two undefined apple trees, but similar to Coxes Orange Pippin apples. I decided to use some of my Bramleys, all safely harvested, wrapped in newspaper and stored in the garage for a comforting cakey dessert one evening. As well as cooking with some of my Bramley apples, I also wanted a quick and easy recipe, as I am extremely busy right now and I am always on the lookout for stress-free recipes that are easy to whip up when I have been travelling and have a backlog of work to get through! So, I decided to turn to my microwave and create an easy recipe for some microwave cakes. I have made cakes in the microwave before, Little Coffee Cup Chocolate-Chip Cakes with Vanilla Cream Froth, which I call the original cupcake; they are easy to make and more importantly the recipe is very easy to adapt for one person or more, which is excellent if you are a solo diner or you just want to make a couple of cakes for the children’s dessert after a mid-week tea. I also made my Christmas Pudding last year in the microwave too, again, for ease as I was so busy, and it was just as delicious as my usual steamed pudding. The microwave can be such a useful tool for busy cooks, and it is also perfect for heating up drinks, defrosting frozen food and “steaming” vegetables. But, cooking cakes in the microwave can result in overly dry and “chewy” bakes, so I wanted to try to debunk the myth that cakes cannot be cooked in the microwave and the recipe for Magic Microwave Mug Cakes that I am sharing today certainly proves that. The tip is the make the batter runnier and more liquid than usual, and to microwave the cakes individually, so there is no need to cook for a long time to get the middle of the cake to set which ensures a moist texture. Enter the humble mug for this recipe! 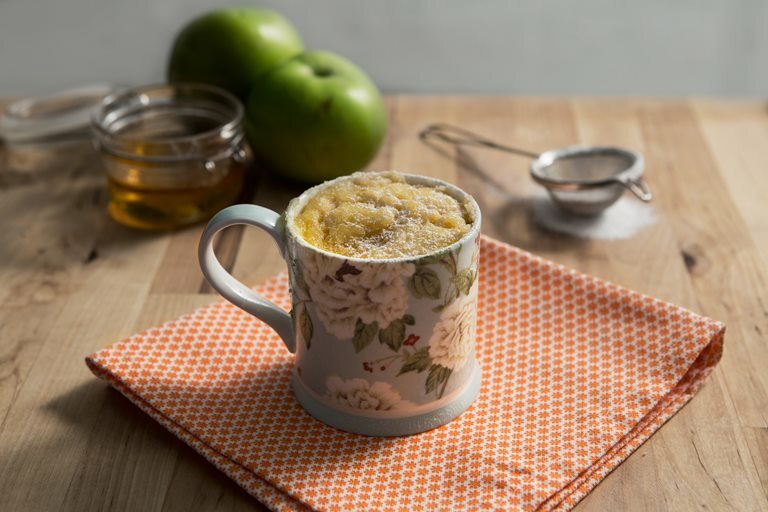 A cake in a mug in the microwave is a BRILLIANT idea for busy cooks and you can adapt the basic batter to add your own flavourings. There is NO weighing and measuring as such, as the recipe I have given is simple and uses tablespoons as its basic measurement. For every ONE egg, you can make up to FOUR mug cakes of varying sizes – for example, I used one egg for the cakes in my photos, and I got TWO large mug cakes and a baby sized “kiddie” mug cake. The ratio is simple, it’s two tablespoons of self raising flour to every mug with one tablespoon of sugar and oil; this ratio will work with one egg for up to four mugs, but it depends on the size of the mugs. If you are only making one mug cake, you can make the batter up with the egg and store it in the fridge for up to two days for future cakes or even American style pancakes. The recipe is shared below and is based on four mugs and I have also added some cooked Bramley apples and golden syrup to the recipe, which makes a delicious cake style pudding that can be enjoyed for dessert or as a snack in front of the telly! I have added some other flavour suggestions in the recipe, do adapt it to suit your personal tastes, but, DO try this delicious apple and syrup version too, it is simply lush!